Can you believe it? 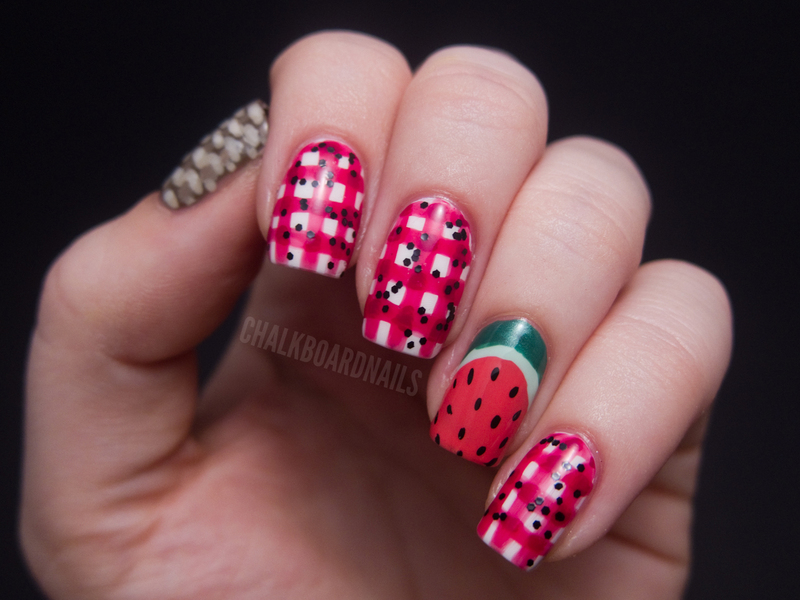 I actually have more nail art for you today! 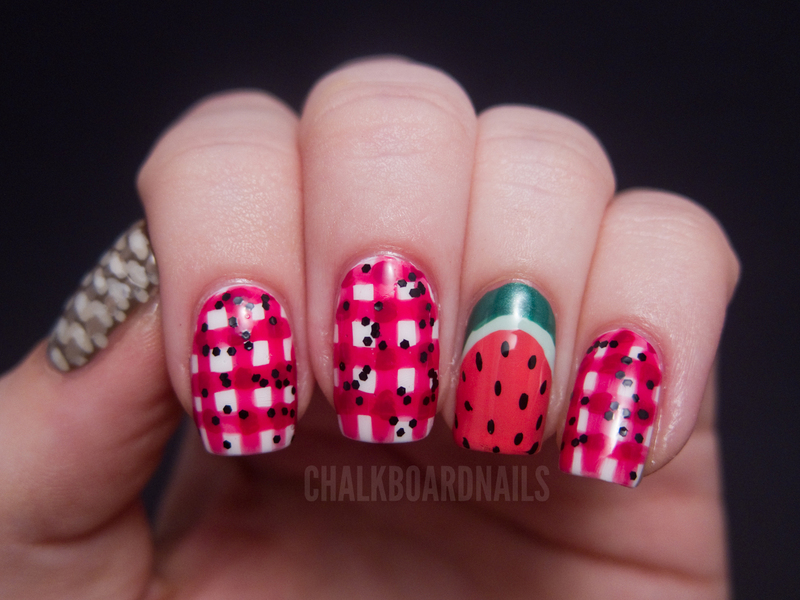 This look is a bit of a mashup, though all of the ideas in this manicure still fit the theme of picnics! I love picnicking, but I definitely don't do it enough. It's usually too hot here in the ol' desert. Indoor picnicking anyone? There are a lot of colors used in this, so if you get confused about what I used and where I used it, I made you a diagram that can be found at the end of the post. 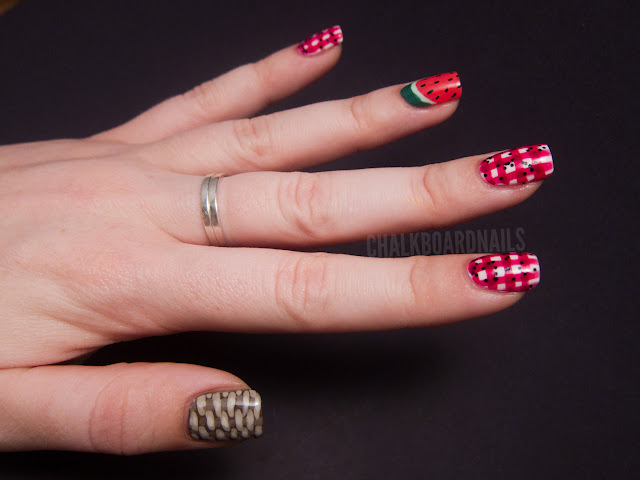 So as you can see, three of the nails are painted to look like the classic picnic blanket. I used OPI Do You Think I'm Tex-y, a jelly, to try to achieve the darkening of the lines where they overlapped, but I ended up having to add to those bits with OPI Manicurist of Seville anyway. The picnic basket nail on my thumb is made of two colors, OPI Did You 'Ear About Van Gogh and China Glaze Street Chic, as well as some blends of those colors. I painted the base color (Street Chic), then added the horizontal bars (DYEAVG), then the darker vertical bars (SC + DYEAVG), and then went back and added the lighter highlights on the horizontal bars (DYEAVG + white). It's a bit more realistic than the other nails, which are more on the cartoony side, but I still like the way it fits in with them and completes the picture. Again, please see the diagram at the end for specifics. 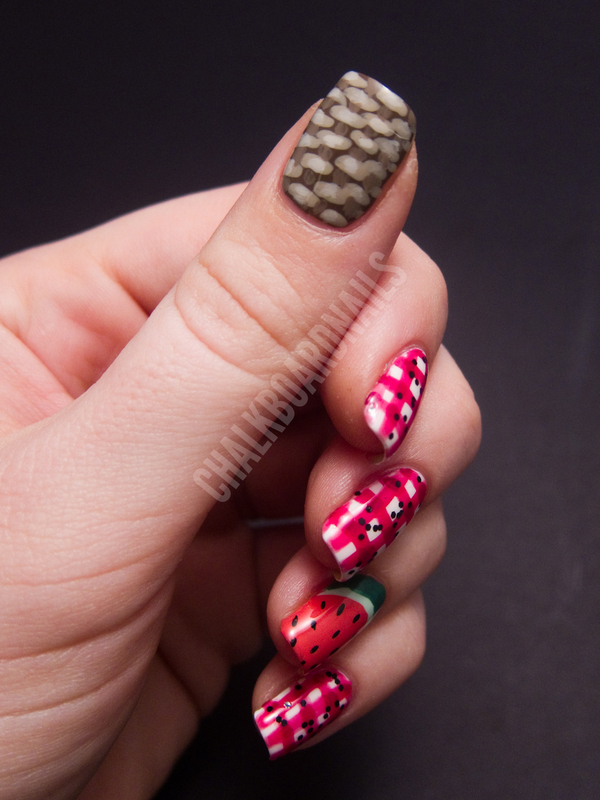 Then finally, the watermelon was made by painting the whole nail with Zoya Lo, and then freehanding on the rind bits into a Ruffian sort of shape with a small nail art brush. The lighter part of the rind is China Glaze Re-fresh Mint, and the darker part is Sally Hansen Going Green. Then I just added some black seeds and that was it! All of these nails were freehanded with the same brush -- a striper on the shortish side (like the brush on the left here). As promised, here is the diagram that shows the colors that I used on the various parts of the manicure! I think some of you will find this helpful. As always, I hope you guys enjoyed this manicure. I'm definitely happy with it! :) 'Till next time! This is so cute! It makes me want summer! OMG hahahaha this is adorable! i loved the photo with the breakdown of all the colors! so fabulous! i love it! i want to do that! So cute! I love the crumpets comment. lol with a pointer on a white board comes to mind. Love it and it's just too cool!! Eeheehee!! 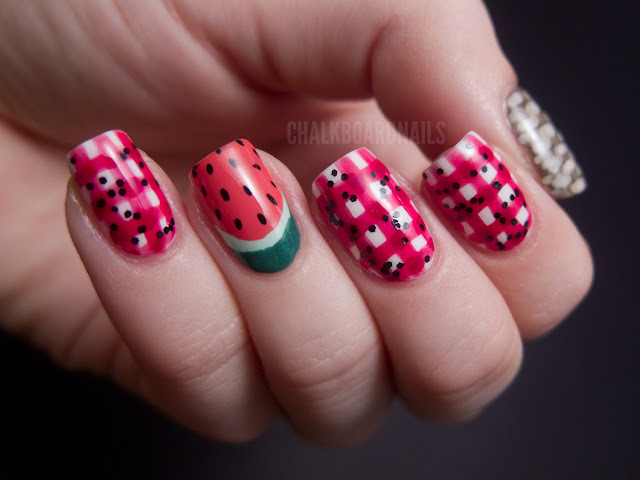 This is too adorable, what a great manicure! This looks awesome! Such a cute idea and perfect execution! I love the diagram at the end too! Great work! i love... this is such a pretty design! Thats such a cute idea and the basket especially looks awesome! ooh, it's giving me ideas! thanks. Really great idea. I think the basket weave is my favorite part. Would look cool as a full mani... Maybe with metallics? LOL! This is really cute! Ok this is seriously too cute. The basket nail just boggles my mind - it looks like it's moving the whole time, wow!